We all think and communicate differently. As a marketer, your primary objective is to ensure that your message is being heard and clearly understood by your targeted audience. To improve the impact of your marketing messages, ensure that you are answering the following four questions when marketing – “what”, “how”, “who” and “why”. For example, what is the goal, purpose or outcome? ; how do you want me to respond? ; who are the stakeholders? and why does this matter to me? My clients, friends, family and even myself were overwhelmed, frustrated and felt like failures for our inability to conquer our busyness using popular, “proven” time management strategies and tools. I realized that the problem was not my clients, friends and family. It was how they were trying to overcome their busyness that was the problem. In order to overcome their busyness and work simply, they needed to personalize their productivity. You cannot outwork your busyness using one-size-fits-all time management solutions. The latest app, prioritization tip, or email management strategy will not work if it is not personalized for you, aligned with the way you think and process information. Your productivity strategies must be customized for you – not for someone else – because your life is waiting. 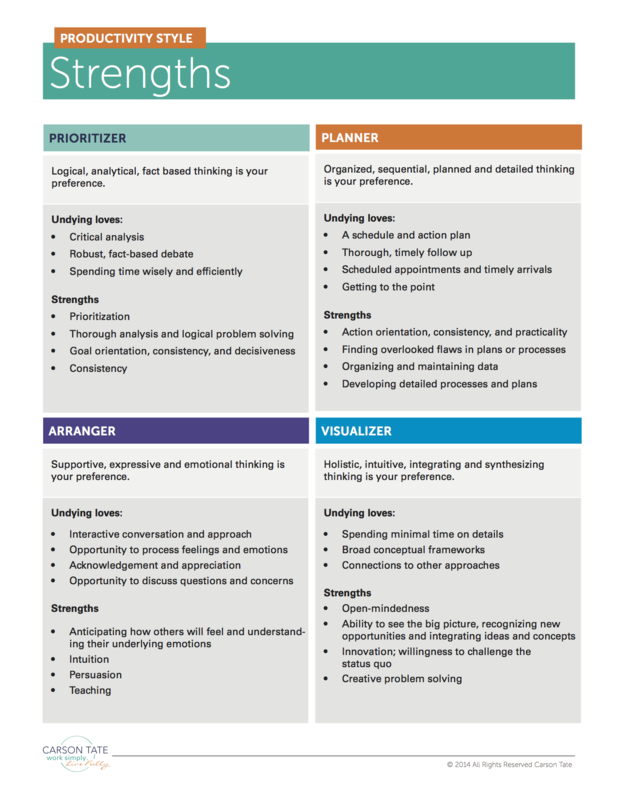 To personalize productivity – to employ work strategies that align with your cognitive style and plan and allocate effort and time in a way that suits your Productivity Style strengths and preferences. I help individuals, teams and organizations simplify, streamline and organize their work flow so that they are more efficient, effective and profitable. Getting Things Done by David Allen. Allen offers a tangible, actionable workflow management system that resonates and works well for many people. Switch: How to Change When Change Is Hard by Dan and Chip Heath. A simple, yet powerful approach to driving individual and organizational change. Thinking Fast and Slow By Daniel Kahneman. An insightful exploration of the two systems that drive the way we think and how these systems impact not only corporate decision making, but also, our own predictions of what will make us happy in the future. The biggest challenge that I’ve had to overcome in my career is moving beyond ego based decisions to heart based decisions. My wakeup call came ten days after my daughter’s first birthday when I realized that I had no significant memories of her first year of life. I had spent the first year of her life on the road, building my business and obsessively trying to live up to some idealized and ego based definition of success. I had nothing significant and truly meaningful to show for that year. In that moment I realized that something must change and I needed to let my heart have a strong voice in my career and life. I love to get dirty and be outside, so participating in Mud Runs is a fun and exciting way for me to play. Yes, my Harvard Business Review article, Match Your Productivity Approach to the Way You Work. Over 46,000 people read the article and took the Productivity Style Assessment.